Your local Oxfam shop is the perfect place to snap up pre-loved clothes, books, vintage items and lots of other hidden treasures. 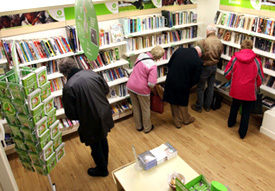 Every penny or cent you spend in any one of our shops in Ireland helps to support our wonderful work around the world. Our shops also accept any unwanted clothes or other items you might have – so do yourself, and others, real good and drop in today! Drop into any one of our shops to find that special bargain or to donate any unwanted goods. We're always happy to receive the things you don't want and turn them into real good. Find out about the things you can donate. Find out about our donation and recycling banks, where you can drop off your unwanted items and help us to change lives.